Keith Tkachuk is four goals shy of the 500 career goal mark and stands to become the fourth American-born player to reach that milestone. The first three were Joe Mullen, Mike Modano and Jeremy Roenick. With 23 goals this year, Tkachuk has scored 20 or more goals 14 times in his 16-year NHL career. Carl Corazzini scored his 23rd goal of the season for Grand Rapids and added another in the shootout, but it wasn’t enough to keep the Griffins from being edged by Milwaukee, 3-2. Tim Kimball, who was a freshman defenseman on the 1977-78 Terrier national championship team, will be inducted into the Beverly (Mass.) High School Sports Hall of Fame on April 5. 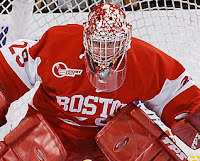 This past Tuesday, March 25 was the 30th anniversary of BU’s 5-3 win over BC to claim it’s third NCAA title, chronicled in an original Terrier Hockey Fan Blog article. Tim Kimball, Beverly High School Class of 1977, was known as one of the finest hockey players ever at BHS. He was highly skilled in hockey fundamentals, a strong skater, great stick handler and possessed one of the finest shots in hockey for a high school player. Tim had good hockey sense, was a scoring defenseman and was also a stalwart defenseman. He was a fine team player and was adept at getting his team out of the defensive zone. Massachusetts Top Schoolboy Defenseman award. Tim was the all-time leading scorer among defenseman in BHS history. His second passion was soccer. He was team MVP and co-captain in 1977, and was NEC and Boston Soccer All-Star. Tim also won varsity letters in track in 1975 and in baseball in 1977. 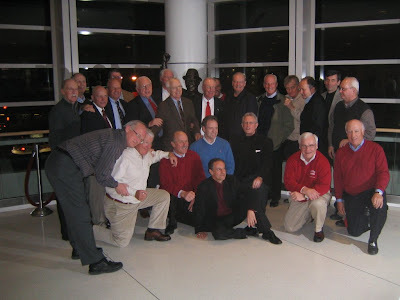 Tim took his many hockey skills to Boston University and was a member of the 1978 NCAA Division I Ice Hockey championship team as well as the 1978 and 1979 Beanpot Tournament championship team. In the 1920s, the heyday of silent movies, the biggest star was actress Clara Bow, the “It Girl.” The “it “ she had, but went largely unspoken, given the times, was “sexiness.” An NHL.com feature (check the video link) on former Terrier captain and Hobey Baker Award winner Chris Drury declares “Drury's got 'it', Rangers are delighted.” In this case, the “it” is his ability to deliver in the clutch, when the game is on the line. By the numbers, his track record is nothing short of remarkable. Of his 216 career regular season goals, 43 –or one in every five—have been game-winners. On the bigger stage of the Stanley Cup playoffs, he’s been even more clutch with 15 of 43 goals being game winners, and more than a few of those in overtime. In the article, his teammates offer their theories of how Drury, hardly the biggest guy out there, consistently puts himself in position to score those deciding goals, often right at the goalmouth. Last night, Drury delivered again, not a game-winner, but the tying goal, with five minutes left in what had been a 1-0 game, beating Devils’ goalie Martin Brodeur, arguably the game’s best netminder. Rescued from a narrow defeat, the Rangers went on to a shootout win. In the AHL Dan Spang scored his 8th goal of the season for the Worcester Sharks and John Curry picked up his 20th win in 28 decisions for WilkesBarre/Scranton, while reducing his goals against average to a league best 2.04. Last night’s 5-3 win over UM-Lowell in the first game of the Hockey East quarterfinal series featured a 3-point night for Pete MacArthur and some news milestones for the Terrier captain. He moved into a tie with two-time All American Herb Wakabayashi for 19th on the BU career scoring charts with 145. His 18th and 19th goals of the season raised his career total to #62, tied for 28th with Carl Corazzini. NESN Video highlights. Game 2 of the series is a 7 p.m. start tonight with senior Karson Gillespie in goal for BU. Goalie Kieran Millan’s Spruce Grove Saints are becoming the Cinderella story of the AJHL playoffs. After losing all six regular season games with Grand Prairie and then dropping the first two in the second round playoff series, Millan has backstopped the Saints to three straight wins, including last nights’s 3-2 overtime victory. But for the Stouffville Spirit, it was the end of the line as they were eliminated by Aurora, 3-2 in overtime, from the OPJHL playoffs, despite the efforts of Corey Trivino and Ethan Werek. Trivino had a goal and an assist, bringing his team-leading post-season totals to 5-17-22. Werek, who edged out his future Terrier teammate by one point in regular season scoring (70 to 69), assisted on both Spirit goals. Chris Connolly’s 24th goal of the season, in Omaha’s 5-2 loss to Waterloo last night gives him 52 points in 52 games, good for eighth on the USHL leader board. Who’s in first? Chris’ younger brother Jack, a Minnesota-Duluth recruit. Earlier in the week Connolly had two assists and a key shoot out goal in a sdsdsd win. Wilkes-Barre Scranton Penguins fans are learning what BU fans know well: that John Curry is a superb and clutch puckstopper. Curry turned in another strong effort last night in a 4-1 win over Bridgeport, boosting his record to 18-8-2, to go with a 2.15 GAA. They’ve also learned that fighting is not Curry's strong suit, as this video clip demonstrates. With 7 ½ minutes left in the third period, a fight broke out and Curry skated out of his crease to square off with the Sound Tigers' goalie and the results weren’t pretty for the ex-Terrier All-American. Lost the fight (but not the game) and received a game misconduct for his trouble. Curry assesses his first pro season in a Q&A interview from the Pens Web site. 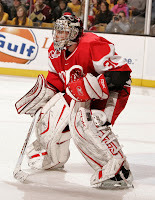 Sean Sullivan, BU’s captain in 2006-07, spent much of the early season in the ECHL, but has been recalled to San Antonio, the Coyotes’s AHL franchise. In 27 starts, Sullivan has four assists. David VanderGulik, in his second season in the Flames organization has reached the 30-point mark for Quad City. Ken Roche, who began the season playing for Joe Sacco on the new Lake Erie Monsters club, now is skating in the ECHL for the Johnstown Chief, recording 17 points in 21 games. Much traveled Tom Poti is thriving in Washington with the surging Capitals, after several seasons in New York with both the Rangers and Islanders. The Terriers begin their second season tonight with Hockey East quarterfinal action against Blaise MacDonald’s UMass-Lowell River Hawks. Links to games notes, game tracker and the radio Web cast are now available. NESN is telecasting tonight’s game. Subsequent quarterfinal games are available as pay-per-view Web casts on the B2 Networks. 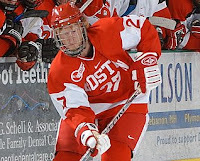 Series previews have been posted by USCHO’s Dave Hendrickson and College Hockey News. In his comments during this week’s Hockey East teleconference, Coach Jack Parker announced that sophomore goalie Brett Bennett (photo) will start game one and that senior Karson Gillespie will be in net for the second game. Congratulations to senior Pete MacArthur, whose hattrick against Providence College earned him Hockey East Player of the Week honors, and freshman Colin Wilson, who was named INCH's Hockey East Rookie of the Year. INCH also named MacArthur to its conference all-star team. Kieran Millan’s Spruce Grove Saints hadn’t beaten Grand Prairie once in the regular AJHL season and the first two games of the second round playoff series continued the pattern. But Millan led his team back with a particularly strong effort in a 3-2 overtime win on Tuesday, followed by a dominating 8-1 win on Wednesday. Game 5 will be played on Friday. Stouffville, with BU recruits Corey Trivino and Ethan Werek, is on the brink of elimination, trailing in its conference finals series, 3-1 following last night's 5-2 loss to Aurora. Defenseman David Warsofsky picked up his 10th goal of the season in the USA NTDP U18's 3-2 win over Alpena/NAHL this week. With 30 points, he's now tied for second in scoring on the U18s with fellow BU recruit Vinny Saponari. Warsofsky also scored a shootout goal (not included in his total) in the U18s 3-2 loss to the St. Louis Bandits last Sunday. 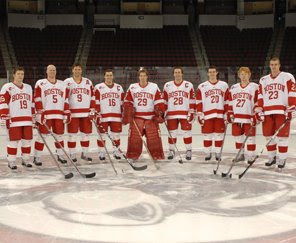 BU's newest recruit for 2008, defenseman Ryan Ruikka, was at Agganis Arena for last Friday's regular season final against Providence. Ruikka and the Jersey Hitmen face of with the New Hampshire Junior Monarch's in the EJHL finals at Holy Cross this weekend with games on Saturday, Sunday and Monday. 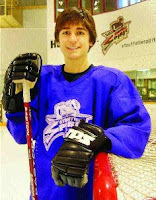 Freshman Joe Pereira was the top goal scored last season for South Kent School. 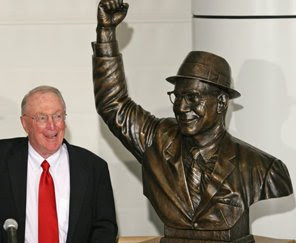 He was succeeded this season in that role by brother, Mike, who racked up a 27-25-52 line. 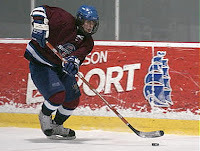 His 27 goals tied 2008 BU recruit Andrew Glass of Nobles for 4th best in the Northeast prep ranks. The Terriers’ regular season finale is on tap tonight as they take on Providence College in the second half of the home-and-home series. It’s also Senior Night with nine members of the Class of 2008 to be recognized. Links to gamenotes, gametracker and the WWZN Webcast are now available for the contest which also airs on NESN beginning at 7:30 p.m. BU All-Access, which covers all BU sports, can be heard at 6:30 p.m. on WZZN. Senior Ryan Weston and Coach Jack Parker are among the scheduled guests. Last night’s 6-0 shutout of the Friars included several milestones for senior Pete MacArthur, whose hattrick gave him 60 career goals, tying him with Clark Donatelli and Steve Stirling. It also pulled him into a tie for 24th on the all-time Terrier scoring list with Terry Meagher. And it made MacArthur BU first 40-point scorer since Mike Pandolfo in 2001-02. Brett Bennett, who recorded his third shut out in his past six starts, gets a rest tonight as senior Karson Gillespie returns to action following an ankle injury back in January. Last night's win clinched home ice for the Terriers who can finished 2nd, 3rd or 4th depending on the outcome of the rest of the weekend's games. Quarterfinal action in the Hockey East Tournament begins next Friday night against a to-be-determined opponent. Playoffs are under way in most of the U.S. and Canadian junior leagues and Terrier recruits have been at the center of the action. In the OPJHL, Stouffville tied its division semi-final series with Huntville at three games apiece today behind a pair of Ethan Werek goals. In nine playoff games, Werek has a team-high 14 points (6g-8a), tying him with Corey Trivino, who had an assist in today’s win. In the first round of AJHL playoffs, Spruce Grove goalie Kieran Millan is at the top his game, shutting out Lloydminster 4-0 Friday and stopping 36 shots. The next night, he held the Bobcats in check again, in a 5-1 win, earning his coach’s praise. BU’s two newest recruits will playoff action, too. On Friday in first round BCHL play, Grant Rolleheiser stopped 37 of 40 shots, keeping Trail in the game against a bigger, and more-high powered Vernon Vipers team in a 3-2 loss. Last night, the Vipers put a thumping on Trail, 7-2, chasing Rollheiser after two periods. Details on Shawn’s Smoke Eaters’ Blog. Note: Trail Blogger Shawn Mullin advises Terrier fans that "when the Smokies play at home in the playoffs [Monday night] there should be a live video feed of the game on the BCHL website. You just have to sign up for a free Fanzone membership and apparently they'll have at least one home game you can watch." In the EJHL, Kevin Gilroy netted a pair today to lead the South Shore Kings to a 6-3 win over Syracuse, tying the first round series at one game apiece. Vinny Saponari had a goal in the NTDP U18s 3-3 tie with Nebraska-Omaha Saturday and an assist in a 4-2 loss to Alpena/NAHL today. Saponari’s 30 points (13g, 17a) are second best on the U18s.